Not everyone can be an inventor, but inventors can be found everywhere. Teo Kermeliotis at CNN describes a boy inventor in Africa who is destined for great things. “Richard Turere, 13, doesn’t like lions. In fact, he hates them. 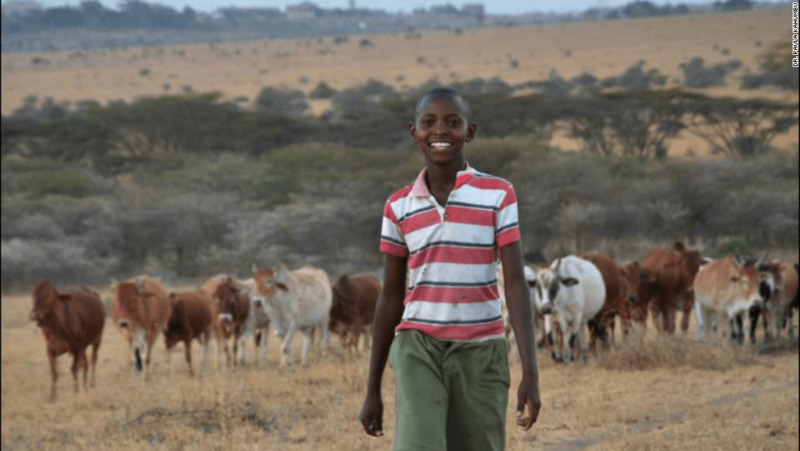 Yet this bright Maasai boy has devised an innovative solution that’s helping the survival of these magnificent beasts — by keeping them away from humans. “Turere realized that lions were afraid of venturing near the farm’s stockade when someone was walking around with a flashlight. He put his young mind to work and a few weeks later he’d come up with an innovative, simple and low-cost system to scare the predators away. “He fitted a series of flashing LED bulbs onto poles around the livestock enclosure, facing outward. The lights were wired to a box with switches and to an old car battery powered by a solar panel. “They were designed to flicker on and off intermittently, thus tricking the lions into believing that someone was moving around carrying a flashlight. “And it worked. Since Turere rigged up his ‘Lion Lights,’ his family has not lost any livestock to the wild beasts, to the great delight of his father and astonishment of his neighbors. Stop me if I already told you this. Now Jamie Condliffe at Gizmodo announces that the 2.0 version has arrived. Well, he didn’t exactly say that. I’m using poetic license. The new version, the Pancake-omatic, not only breaks eggs, using technology very similar to my own (and Joanna’s) innovation, but it also makes pancakes. “Dreamt up by a team of four design engineers, it took over 200 hours to construct and a further 100 to test. [Joanna and I worked much faster.] The result seems worth the effort, though: from the moment a hen lays an egg sat upon the throne, its journey to the frying pan is both seamless and entertaining. “Watch as the egg wobbles its way toward a hoist, to be cracked by a knife [WE had a knife!] and whisked up, before finally being deposited into the frying pan where it belongs. The machine will be on display in London’s Design Museum later this month.” More. Be sure to “like” project sponsor the Happy Egg Company on Facebook, here. Connecticut seems to be doing quite a lot for entrepreneurs — even rather young ones. 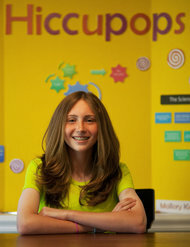 So thanks to an annual competition for young inventors in the state, Mallory Kievman is getting her hiccup-suppressing lollipop patented and marketed by experts. Writing for the NY Times, Jessica Bruder quotes one of Mallory’s benefactors. “Mallory met Mr. Briere last spring at the Connecticut Invention Convention, an annual competition for kids. ‘I went there, and I knew it would either be a hit or a miss project,’ she said. ‘People would either like it, or they would think I was crazy.’ ” Read more. I love reading about simple but valuable solutions to everyday challenges. Think paper clip. Think Post-it note. It takes a special kind of imagination. Nowadays, given the valuation of apps, you would think solving everyday challenges was too uncool for the inventive mind. But Hiccupops will likely bring Mallory checks in the mail long after Instagram is forgotten.